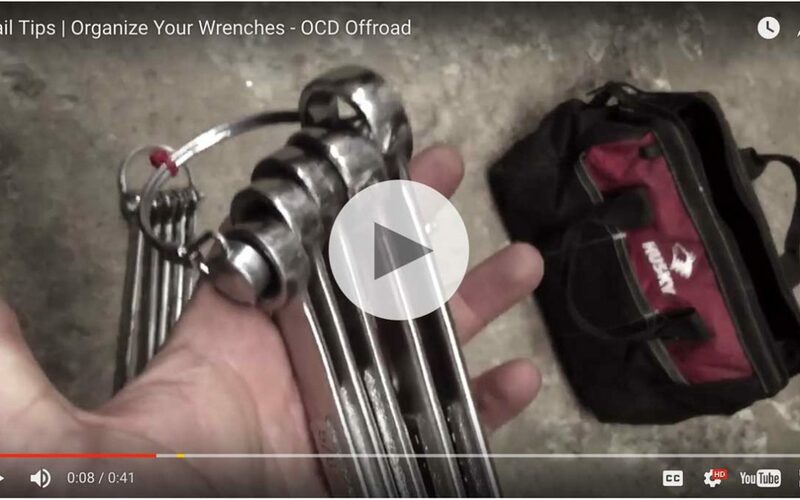 The $10 secret to organizing wrenches in your Jeeps trail bag! Easy trick for organizing wrenches in your trail bag! Lets face it we all lose our tools… a LOT! Your Jeep is stuck in the middle of the night on the mountain, with a tie rod end. That $2 led flashlight from Harbor Freight is on the fritz … again. And ya, you just put in new batteries. Tempers are already high, and this is no time to be rooting around in a bottomless pit of a trail bag looking for a 3/4″ wrench to loosen a castle nut. We’ve all been there, or will be there at some point. The idea came to me one day while I was picking up some chain links for my trailer. Everyone knows I like things organized and easy to find. (It’s called OCD Offroad for a reason). The hitch pins (wire lock pins) come in LOTs of sizes and shapes. You can order them for $3 or so online, or pick them up in person from places like Lowes. I fit 4-5 wrenches on each, and just wrap a red zip tie for standard and blue for metric. They wont come apart in your bag, even if you throw them around. PERFECT! Enjoy the tip and see you on the trail!